Just like in the first album, renowned guest musicians play on this album as well: Róbert Farkas (violin and piano accordion) known from Budapest Bár; Gusztáv Balogh, the best male Gypsy singer of our times; Napra’s Hegedűs Máté (violin) and ex-Anselmo Crew Ákos Kerényi (bongo). The folkmusic of Hungary and Middle-East and everything what touches our sences. 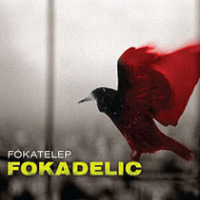 Fókatelep was founded in 2007 based on jam sessions of the members of Korai Öröm, a psychedelic world-beat band known far beyond the borders of Hungary. After Annamária Oláh had joined the group, the instrumental music gradually changed to the present song-like form. During its first year the improvising, ambient project has become a strong folk-rock group. The band rapidly found its audience and plays in more and more prestigious scenes. Among these were the successful concerts at the major Hungarian towns and festivals and on the closing day of the Hundertwasser exhibition of the Museum of Fine Arts. In October 2009 the band toured in Northern Europe with success. Besides the concerts its members gave workshops in few Dannish schools. Their first record introduces us to the world of primarily Hungarian but also Bulgarian, French or Indian folk style songs with energetic rock flavour. The meeting of the experienced musicians with the young, but extraordinarily talented singer and songwriter caused a strong album with its own signature. Fókatelep do not commit themselves to either of the wide range of styles (folk songs, chanson, metal, electric) they are inspired by. Their characteristic „fóka sound” is more a mixture of all the above. Yallah Yallah is Indian-inspired „raga-rock” with Bulgarian folk instruments, Fly away is folk-like song arranged as a heavy „piano metal”. With their adaptation of Gloomy Sunday they created a Hungarian trip-hop from the classical Rezső Seress song known throughout the world. Apart from Annamari’s lofty voice the ethno feeling is fortified by Nikola Parov’s appearance as guest on the album. The worldwide-known musician, who recorded albums among others with Márta Sebestyén, played traditional Balkan instruments in several songs.